Those of us who are cognizant of orthodox Objectivists at their worst knew that the discussion/debate with Jordan Peterson that was held at OCON could have ended very badly for the Randian cause. Luckily for the denizens of ARI, Brook and Salmieri managed to escape any serious mishaps. They wisely avoided challenging Peterson on issues relating to psychological science and tried to keep to discussion restricted to areas where they thought they had an advantage. Consequently Peterson delivered no Cathy Newman killshots (not that he wanted to) and Brook and Salmieri escaped relatively unscathed. While that's a kind of a win for Brook, on the other side of the coin, I don't believe things ended quite the way Brook had hoped. It appeared to me that Brook and Salmieri were using different strategies. One of the great weaknesses of orthodox Objectivism is that they have trouble understanding non-Objectivist thinkers. They are more interested in refuting and/or condemning people with different views than understanding them. This approach to their adversaries caused Brook to adopt a strategy that wound up backfiring. Brook seems to have gone into the debate under the illusion that Peterson is an opponent of metaphysical realism). At one point in the discussion, Brook waxed on about the independent existence of his water bottle, only to be stymied when Peterson kept agreeing with him. Salmieri meanwhile was pursing a somewhat different strategy. Instead of trying to score points on Peterson (which wasn't going to happen in any case), he seemed more intent on trying to impress Peterson, often looking for points of agreement and sedulously avoiding contentious rhetoric. When, for example, Salmieri launched into his critique of American pragmatism (which Peterson espouses), he made a point of stressing what he liked about those philosophers. The general impact of Salmieri's strategy is that it blunted Brook's attempt to use Peterson as a foil to present Objectivism to a wider audience. Peterson came off looking closer to Objectivism than he really is, and Brook failed to present Rand's creed as a superior alternative to Peterson's views. This is not to suggest that there weren't important points of disagreement between Salmieri and Brook on one side and Peterson on the other. The most important of these revolved around the question of values. Are "rational," "objective" values possible? Can human beings regulate their behavior on the basis of a "rational," articulable ethical philosophy? Peterson took the negative on these questions, Objectivism the positive. In this section of the discussion, Peterson shined and Salmieri and Brook floundered. Salmieri commenced his defence of articulable rational morality by essentially conceding Peterson's point without, however, fully appreciating that he had done so. (This was Salmieri's weakest point in the discussion). Meanwhile, Brook tried to leap over Hume's is-ought gap by stressing the role facts in ethical calcuations. This, of course, is something Rand attempted to do in her essay "The Objectivist Ethics," and it happens to be flat out wrong. The is-ought gap does not deny that facts can be used in ethical reasoning. What it denies is that ethic can be founded exclusively on facts. These ethical issues are, however, very subtle and complex and not well understood by most people. For this reason, even though Brook and Salmieri floundered, it wasn't a complete disaster. Their fans thought they got the better of Peterson on this issue, and many people watching the video probably failed to appreciate how poorly they performed. One thing Peterson knows something about, both as a researcher and clinician, is IQ. He discussed this at 25 on. Salmieri and Brook wisely decided not to challenge him on it. he had a million bucks! "It's like there's an attraction/repulsion dynamic going on, and the most likely explanation for this is that, at some very deep level, these Objectivists are not satisfied with their lives. There are parts of their nature, as human beings, that are being trampled on, distorted, mauled by adherence to Randian ideology and what that involves in practice. Tew comes off as an arrogant, absurdly opinionated, fanatical, even hateful ideologue. Is this the kind of person he really wants to be?" Maybe it's a question of jealousy. Objectivism has been an organized movement since the NBI and out of the blue comes Peterson with a number one best seller which is sympathetic to traditional religion, etc. It's curious to watch orthodox Objectivists develop strategies to try to square the Randian view of free will with evolutionary pscyhology. Essentially, when it comes to issues of human nature, cognition, psychology, evolution, Objectivism transcends facts. The Objectivist view of free will is, to borrow a term from Pareto, extra-empirical. It's not supported by the last fifty years of scientific research. When extra-empirical theories, whether religious or ideological in nature, conflict with science, we end up getting these odd attempts to try to rationalize away the differences, and that's what I see in this video. "Essentially, when it comes to issues of human nature, cognition, psychology, evolution, Objectivism transcends facts." 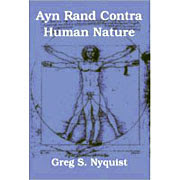 O's fatal flaw is its view of human nature, as you well know ("contra human nature"). It originated with Rand's childhood assumptions about the psychology of, in essence, a comic book hero (Cyrus). She said several times that this inspired her view of capital-M Man, which in turn inspired her philosophizing (and the intention of the philosophizing was only ever a tool to create such characters for her novels). Very funny/sad to think about where O. actually comes from--it is certainly an instance of the triviality around which "philosophic" "movements" can be built. Cyrus doesn't need IQ, tradition, the transcendent, community, etc. He fights the Raj's tigers with FREE WILL, by THINKING (like little Alyssa does). Since anyone can THINK if only he or she WILLS it, all people are--in all other respects--equal. Replace "Cyrus" with "Spider-Man" and "tigers" with "the Green Goblin," and neglect to study science, history, anthropology, and maybe you too can be the next "rational philosopher." "Jordanetics: A Journey Into the Mind of Humanity's Greatest Thinker"
You can get it online from the usual outlets.